When a large truck collides with a small car, the outcome is dramatic and almost always bad for the people in the car. We have small cars sharing the same roadway with larger, taller, heavier trucks. That difference in size and weight is called "vehicle mismatch" and it can be devastating. Death and life-changing spinal cord injuries are the frequent result of "vehicle mismatch" collisions. 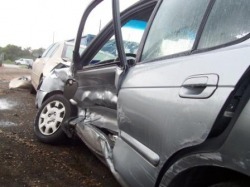 For different types of crashes, injury patterns can be identified. In side impacts, head and upper thorax injuries are frequently encountered due to high bumpers that strike the car above the side door reinforcement. In frontal impacts, severe multiple extremity fractures along with head and chest injuries are caused by intrusion of the instrument panel and steering column. Side airbags help prevent some head injuries, but we need to be more aware of this "vehicle mismatch" hazard and urge auto manufacturers to improve vehicle compatibility, especially bumper and frame heights. Another positive action would be reinforcement of the entire car door. It is possible to reduce these injuries and deaths by making vehicles more compatible in height, weight, and rigidity.